I was not always adventurous when it came to trying new food. That’s the reason I never bought parsnips until recently. I bought it once 5 years back and did not like it that much. Although parsnip looks just like carrot, it has a unique smell and flavor which I didn’t appreciate then. Fast forward 5 years, I’m much better now. I’m drinking green smoothies and eating kale salad! So when I saw the parsnip muffin recipe here, I was curious and wanted to give it a shot. I veganized the original recipe by using vinegar as the egg substitute. I also used maple syrup instead of sugar, whole wheat flour instead of all-purpose flour. I accidentally increased the quantity of parsnip in the recipe and was dreading the outcome and was pleasantly surprised how tasty it turned out. I think the thick consistency of the muffin batter because of this extra cup of parsnip was the reason that I got only 15 muffins instead of the 18 mentioned in the recipe. The spicy flavor of parsnips pairs very well with the other spices we use in this recipe. Bored of the usual fruit muffins? 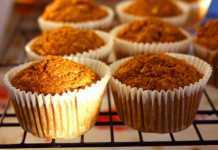 Get adventurous and try this spiced parsnip and apple muffins recipe and you will become bold enough to try a parsnip cake instead of carrot cake. Preheat oven to 350F/180C for 15 minutes. Toast the walnuts while the oven is preheating. 7-8 minutes should be fine. Stir it once in the middle. Chop it coarsely once cool enough to handle. Line muffin cups with paper liners. In a medium size bowl, combine together the grated parsnip and apple. In another large bowl, stir together the rest of the dry ingredients including the walnuts and raisins. Fold in the wet mix and grated parsnip and apple into the dry mix and stir until just combined. Using an ice-cream scoop divide the batter equally among 15 muffin cups. Bake for 20-25 minutes or until a toothpick inserted in the middle comes out clean. Mine was done in 22 minutes. Cool the muffins on a wire rack before storing it. I accidentally used 3 cups of grated parsnip instead of 2 cups. So the batter was quite thick and I had to add some milk to get the right consistecy for scooping it out. The muffins turned out great even after this mess up. 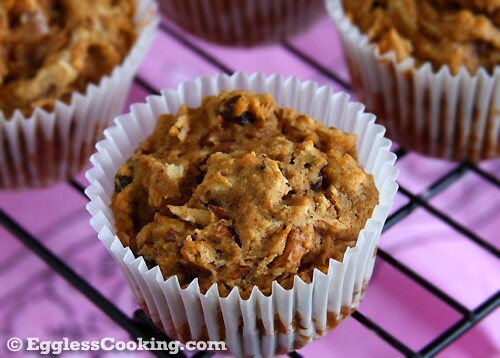 So you should be fine using the extra 1 cup because it makes these muffins even healthier. I used whole wheat flour from Indian grocery store. I notice that this whole wheat flour is very fine textured than the whole wheat flour you get in American/Canadian grocers. This looks more like whole wheat pastry flour, so I have started using it quite often while baking and it does turn out good and is not as nutty or robust like the other whole wheat flour. As always the sweetness was just right for us, which means that others might feel that it is less sweet. 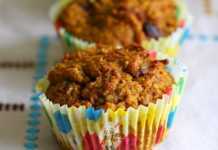 So if you usually prefer sweeter muffins then increase the quantity of maple syrup by another 1/4 cup. Thanks for the recipe. Not sure why my muffins turned out oily. I used whole wheat flour, carrots, and mini vegan chocolate chip instead of raisins. Everything else was as indicated. Cooked a little longer to firm up. Taste good otherwise. Did you by any chance generously grease the muffin liners with non-stick cooking spray? I am trying to make this recipe without added sugars – Can I up the raisin and apple ratio and omit the maple syrup completely? Great vegan recipes on the site ! Hmm..you can try but not sure how it will turn out. You will have to add some other liquid ingredient as well. I wish to say thank you for sharing all the wonderful vegan and vegetarian recipes. I have grown very fond of the Parsnip-Cranberry muffins. I did alter to recipe based on your suggestions with great results. Hello! 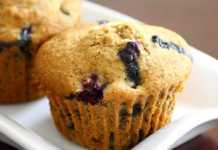 I baked these muffins last night, and they are excellent! I used toasted pecans in mine. My little guy is anaphylaxis to egg, so I am always looking for ways to bake without egg. Yesterday was the first time I saw your website, and I will be back to try more of your recipes! Thanks. No Sheila, I don’t have any. I wouldn’t take that risk because if it does’nt turn out good, you are going to blame the innocent parsnip! I’m not a fan of store bought ginger or ginger/garlic paste. So omit ginger and just go with ground cinnamon or if you are ginger fan, grate fresh ginger in a microfile for homemade fresh ginger paste. I think about 1/4 teaspoon should be enough because it is fresh. Thanks for reply Madhu! Ha ha I would definitely blame my baking skills and not the parsnip!!! Anyway I tried it without ginger and used light brown sugar. It turned out good and sweetness was just right! My hubby could’nt find parsnip at all! Thanks once again. You have a lovely space. You’re welcome Sowmya. I guess you have got one reason to not hate parsnip. Do rate the recipes you try so it would help others who are deliberating whether to give it a shot or not. Hi Madhu, Thanks for the wonderful recipe..No wonder it takes more time to prepare However the final result turned out to be very good.. Very fluffy from inside. Ultimately it was very good with less sweet. This was not like the usual muffins which is too sweet. Wow! you made it already. Thanks for rating the recipe, Archana. Hi, instead of the wheat flour what would you suggest for someone with gluten allergy? Thank you. You could try gluten-free mix or any other gluten-free flour, but with xanathan gum. Thank u so much for a nice recipe. Its tempting me to try it at the earliest. Kindly let me know whatelse i can add instead of vinegar. Can i add lemon juice or egg replacer? If yes what quantity? You’re welcome Archana. You could add about 2 teaspoons of lemon juice instead of 1 teaspoon of vinegar.